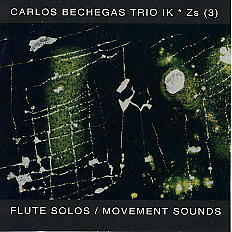 Carlos Bechegas is a Portugese flautist who explores sounds with the use of electronics. The first half of his CD has been recorded with his trio lK*|s(3), the second half is him, solo, using electronics. Both when he is alone and with his group, he plays "structured improvisations" trying to find and develop his own voice on his instrument.